Each personality type has unique strengths and gifts to bring to a friendship. While many articles talk about the dating relationships between types, very few discuss more platonic relationships. What can you expect in a friendship with an INTJ? Let’s find out! If you have a genuine INTJ friend (not just an acquaintance), they will stick with you till the bitter end. These types choose their friendships carefully and are anything but fair-weather companions. It takes a lot to scare them away once they’ve invested in a friendship with you. INTJs have no patience for manipulation or sugarcoating (in fact, they are one and the same to an INTJ). If you want a friend who will be direct and tell you the truth, an INTJ is your man…or woman. If they respect you, they won’t lie to you. It’s as simple as that. Don’t feel like making small talk? Don’t feel like being the life of the party? That’s perfectly fine with an INTJ. They are one of the few types who you can sit with for an hour, maybe reading a book, or just relaxing and thinking, and you will still have had a wonderful time together. They love peace and quiet and won’t begrudge you for needing some. INTJs hate surface-level conversation and shallow topics. If you want someone who can get really deep really fast, call your INTJ friend…or wait, don’t call them…text them. If you want to talk about the meaning of life, the purpose of religion, politics, or any “taboo” thing that’s not proper dinner-table conversation, then an INTJ is a friend you can count on. INTJs are extremely goal-oriented. One of the things they look for (and provide) in a friendship is direction and motivation to reach goals. They usually have big visions and plans for the future and will enjoy sharing those plans with you. They’ll also enjoy strategizing with you and motivating you to reach your hopes and dreams. INTJs have excellent problem-solving skills thanks to their insight into situations and their objective, logical nature. 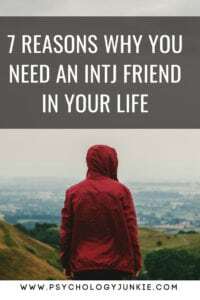 If you want a friend who will listen to your struggles and actually give you wise solutions, not just for the moment, but for the future as well, then an INTJ is invaluable. Just don’t be offended when they offer advice or solutions instead of platitudes and affirmation when you come to them with a problem. INTJs see everything from many different perspectives. When they look at a problem, they step outside of it and try to view it from every vantage point and angle possible. Only then will they form a conclusion. This makes them more open-minded and empathetic than most type descriptions would imply. This also means that in friendships they can help you to see a bigger picture than what is on the surface. Do you have any experiences or wisdom to add? Let us know in the comments! >#6 INTJs have excellent problem-solving skills thanks to their insight into situations and their objective, logical nature. INTJs are dominant intuitives, and only use logic when they have to, and even then, generally to prove their intuitions. Even though they externalize thinking, when speaking with a true friend, they use intuition, just as they would for themselves. >INTJs see everything from many different perspectives. When they look at a problem, they step outside of it and try to view it from every vantage point and angle possible. Only then will they form a conclusion. That is INTP, not INTJ. This is so good! My sister/bff is an INTJ, and all those things are definitely true in our relationship.